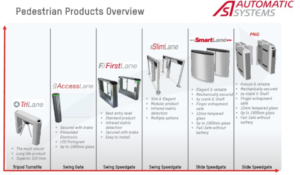 Automatic Systems products deliver all this, plus tremendous reliability. Tripod turnstiles offer dissuasive automated access control for sites with heavy use. This is simple, economical and compact equipment. Security Entrance Lanes provide a high level of bidirectional entrance control without compromising user safety. Their modern yet discreet design fits right into corporate or public environments. A true complement to security entrance lanes, the swing gates complement any facility that requires wide access in order to facilitate emergency egress or accommodate the mobility-impaired, deliveries or bulky objects. Mainly used to lock down the perimeters of enclosed outside areas, our full-height security turnstiles ensure single-user throughput and are extremely weather-resistant. Security doors offer the most powerful solution for physical and electronic security of automated entrance control.